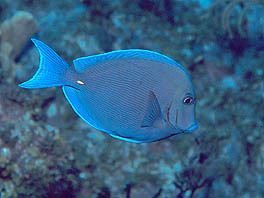 Blue Tangs are common and colorful reef fish found throughout the Caribbean. Click here to see this great photo of a Blue Tang from the island of San Salvador. 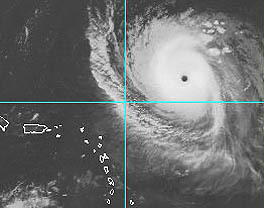 Hurricane Fabian was a category-3 hurricane that slammed into Bermuda in September 2003. Click here to see a Macromedia Flash MX movie about this powerful storm. This Flash Movie is 500 kB. Hurricane Isabel is even bigger than Hurricane Fabian. Where is this storm going to strike? Click here to learn about this storm. 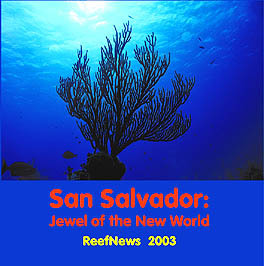 ReefNews is pleased to announce the availability of its latest educational CD-ROM, "San Salvador: Jewel of the New World." San Salvador is a beautiful island in the Bahamas and is surrounded by spectacular coral reefs. San Salvador is thought by many to be the place where Christopher Columbus landed in 1492. This CD-ROM features movies, photos, and cartoon animations with information about all of these aspects of San Salvador, including 90 underwater photos from San Salvador's reefs.